There will be others whose records cause similar problems and can be added in due course. With the searching tools available to us, we have been able to write something (in some cases, a great deal) about the service and civilian backgrounds of most of the men named on the War Memorials (Bottesford St Marys, Bottesford Methodist Chapel, Muston churchyard), the ‘church organ’ list and the list of Absentee Voters (1918-1919). However, there is a minority for whom it has not as yet been possible to prepare an account, because either their civilian background or their service record has not been identified. With regard to civilian life before the war, the major source of information is the census of 1911, with additional information from the General Register of Births, Marriages and Deaths, Parish Records, Trade Directories and other diverse sources. Problems arise, for instance, with men who moved into the parish after 1911. Military service records are beset by the degree to which the paper records were lost after WW1, notably by bomb damage during the Blitz. In many cases, there are some service records but they do not indicate a connection with Bottesford or Muston. This account discusses the situation with regard to certain men from the lists of names and attempts to suggest who they were where this is justified. We hope, of course, that further information will be added in future that will allow the uncertainties to be resolved. In the meantime, we feel it is better to say what we can, rather than set the stories of these servicemen aside as being ‘unresolved’. Samuel and Hannah Baker lived at The Green, Bottesford, as recorded in the censuses of 1901 and 1911. Samuel Baker was a foreman platelayer, a railway man. In the 1891 census, he was the crossing-keeper at Normanton Lane, Bottesford. In 1901, their household also included daughter ‘Francis C Baker’, aged 9, and Samuel’s mother, Mary Baker, aged 77. Their daughter, Kathleen Frances Baker, went on to marry Herbert Porter at the start of February, 1916. 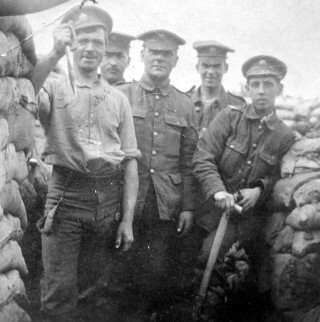 Both Herbert Porter and William Bakers were sappers, and may have known each other. The good news from William would have been an additional cause of celebration at the wedding. It is frustrating that the search of the censuses (1891, 1901, 1911) did not locate a William Baker living at Bottesford. He may have been a nephew of Hannah and Samuel. Surely, the Grantham Journal would have referred to his ‘parents’ or ‘family’ rather than his ‘relations’, had he been their son. The census search did locate at least three candidates from the surrounding area, respectively from Grantham, Denton and Orston. Grantham – The Grantham result is also from the 1911 census. William Baker, born 1881 at ‘Farmouth’, Norfolk, a railway brakesman, is a lodger at the house of Annie Tuxford, a widow born 1855 at Crowland, Lincolnshire. The address is 1 Fletcher Street, Grantham. The household also included Annie Tuxford’s sons Charles, a draper’s packer born 1883 in Grantham, and Alfred Frederick, a railway pointsman born 1889 at Grantham. There was also a second lodger, John Dalton, a ‘machine man’ born 1874 at Metheringham, Lincs. A BMD search for ‘William Baker’, assuming he was born at Yarmouth (‘Farmouth’ assumed to be an error), yielded two possibilities: Percival William Baker, b.1880, or William Benjamin E. Baker b.1879 4th qtr. No death dates were obtained. One of these might be our man, but this is far from convincing. Interestingly, there was a Tuxford family, including cookery writer Hester Tuxford, who lived in Bottesford at this time. Could Annie Tuxford have been a relative? Denton – The result from Denton, a village only a few miles from Bottesford, was in the 1911 census. Thomas Baker, a groom and domestic gardener born 1852 in Staffordshire, and his wife Kate, born 1861 at Dundalk, Ireland, have four children including three sons of whom the oldest was William Baker, born 1896 at Denton. Orston – A search of the Nottinghamshire census search yielded a William B. Baker born at Orston in 1887, whose family lived at Orston in 1891 and 1901, but were not there is 1911. In 1901, the family lived at 24 Church St, Orston. William B Baker, a gardener born 1860 in Lincolnshire, and his wife Sarah H Baker, born 1858 at ‘Showton’, have six children including two sons the elder of which was William B. Baker, born 1887 at Orston. In the 1911 census he is William Brooks Baker living at Aldercar Row, Langley Mill, Nottinghamshire, where he is a domestic gardener. There are thus three possibilities here. Two are ‘William Baker’, with no second Christian name. Of these, one is a railway worker living with a widow Annie Tuxford in Grantham, who might have been a relative of the Tuxfords who lived in Bottesford. Railway workers were liable to move with the job, and he may have transferred from Grantham to Bottesford, and lodged with the Tuxfords in the village, but this is speculation. The fact that the William Baker living in Grantham and Samuel Baker of Bottesford were both railway workers, and that William Baker joined the Royal Engineers, make this the strongest line of enquiry. The third candidate is William B. Baker whose family was at Orston in 1901. In view of the proximity of Orston to Bottesford, he might be the best candidate, but the link has yet to be made. Did he come to work at Bottesford (like Arthur Pritchett from Aslockton), or did he move to Bottesford after 1911? At present, we do not know. A search of WW1 Service Records generally for ‘William Baker’ gave well over 700 results, mostly Medal Index Cards. It is a widespread name. It is impossible to use these data to determine the identity of the man from the Bottesford ‘church organ’ list or his service record. However, one intriguing possibility is that the man we are looking for is the William Baker, born 1878, who joined the Royal Artillery, Private 31399, in 1899 and then served for ten years, leaving in 1909. His Attestation paper states that he was born in Grantham: no precise address is given, so it is possible that this could refer to Sedgebrook, where Samuel Baker came from. He would be approximately the right age to be the man living in Grantham in 1911. After leaving the Artillery, he might have found a job on the railway (uncle Samuel’s influence, perhaps). He could have re-enlisted when WW1 broke out and been accepted into the Royal Engineers, in spite of his age, because of his past military and work experience. This William Baker’s father was Frederick Baker, whose address was 54, Pleasant St., Preston, during the first years of the 20th Century. He might have been railway worker, whose job had taken him to Lancashire from Grantham. A military records search for William B Baker yielded only five records. Frustratingly, all are Medal Index Card transcripts that do not indicate the age of home address, so that they can not in themselves establish a link to Orston, or anywhere else. The five are: William B Baker, 2048 Pte, RAMC, then 337515 Pte RAMC; William B Baker, 49385 Pte, Notts and Derbs Rgt (Sherwood Foresters); William B Baker, 21540 Pte, South Staffs; William B Baker, 88166 Bombardier, Royal Garrison Artillery; and William B Baker, 19542 Pte, The Queen’s Rgt, then 55257 Pte, Labour Corps. However, none of these refers to a Sapper, and so it is unlikely that any of them is the soldier we are looking for. The ‘best bet’ for now is that William Baker was son of Frederick Baker, of Preston, and nephew of Samuel Baker of Bottesford. He was living in Grantham in 1911. He was a railway worker, like his uncle, and had contacts with the Tuxford family of Bottesford having lodged with Annie Tuxford in Grantham. He had already had a long service career, 1897-1910, with the Royal Artillery, and presumably re-enlisted in WW1, joining the Royal Engineers. The major flaw in this view is that the man lodging with Annie Tuxford stated that he came from Norfolk, and was not a native of Grantham. Therefore, the strands of this argument do not tie up, and it remains inconclusive. One of the men on the Bottesford ‘church list’ of WW1 servicemen is Frank Christmas. However, records for this name have not been located, and it seems most likely that the man referred to was Arthur Christmas, the oldest son of Thomas and Martha Christmas and brother of Reginald Christmas, another of the men named on the list. Arthur/Frank Christmas was born in Long Bennington in 1886, son of Thomas Christmas, born in 1851 in March, Cambridgeshire, and Martha (neé Chapman) who was born in 1857 in Wrangle, south of Wainfleet and Skegness. In 1891, Thomas (40) and Martha (36) had come to Bottesford and were living on Queen Street, where they had four children, Edith (8), Ethel and Clara (both 7 years old, probably twins) and Arthur, aged 5. Thomas was employed as a railway signalman. The oldest child, Edith, had been born when he was stationed at Bracebridge, near Lincoln, and the other three when he was at Long Bennington before being transferred to Bottesford. By 1901, they had moved to New Station Cottages, close to Bottesford South station at the West End, Bottesford. Edith was now 18 and working as a dressmaker Clara was 17 but her twin Ethel was not recorded in the census and may have died. Arthur was 15, working as a domestic gardener’s boy, and there were three more children, William (8), Florence (6) and Reginald (5), all born in Bottesford. By the date of the 1911 census, Edith, Clara and Arthur had left home. Arthur and Clara had moved to High Field, Orston, where Arthur was working as a cowman on a farm, and Clara was his housekeeper. No records of Arthur Christmas’s military service have been located. Before and after WW1, he worked for Mr George Goodson. He was also employed by Mr Richmond Daybell who supervised the Walton herd of large white pigs at Walton Hall. After the war, Arthur returned to Bottesford, where in 1931 he married Rosina S. R. Bullimore, and they lived in Chapel Street. He was a member of the British Legion. However, he died in tragic circumstances in October, 1944, when working in the gardens belonging to Bottesford Rectory. He was picking damsons in the Rectory orchard when he fell and broke several vertebrae in his spine. He was found by Mrs Helen Topps, but died of pneumonia shortly afterwards. The name C. Cooper is found on the Bottesford ‘church list’ of WW1 Servicemen. It is not, however, clear what the initial ‘C’ stands for, and no man named C. Cooper has been located in the censuses of Bottesford for 1891, 1901 or 1911. His identity and military service record have not been determined, although we hope that information will be found in due course. In this case, there are records of his family background and residence before the war in Bottesford, and also of his life after the war, when he lived in Nottingham. However, his military service record has not been identified. Edward Cragg was born in 1884 in Sudbrooke, Lincolnshire, son of William Cragg, born in 1858 at Westborough Lodge, Westborough and Sarah Elizabeth (neé Parnham), born in 1857 at Wilsford, Ancaster. In 1891 the Craggs were living in Doddington, where his father William is an agricultural labourer. There were three boys, George Herbert (born 1882, at Great Gonerby), Edward (born 1885 at Sudbrooke, Lincs) and Robert William (born in 1890, at Doddington). It is perhaps unclear whether the village of Sudbrooke near Skegness, or Sudbrook near Ancaster, is referred to, though by association it is more likely to be the latter. In 1901 Edward’s parents lived on on Hickson’s Row, Bottesford. His father had become an ironstone worker. The family at the address were William and Sarah Cragg, together with their children Robert William, Lillie, May and Elizabeth, but Edward, now 16, had left home. Where he had gone is a little unclear. He may have been the Edward Cragg who worked as a farm servant on the farm of George Roberts at Damsbrook, at Clowne, near Worksop, though the census says that this Edward was born in Yorkshire. Another possibility could be Edward Cragg, born in Threekingham, Linconshire in 1887, who had become a scholar at a naval academy in Crawley, Surrey. In 1911, Edward’s parents lived on Muston Road, Easthorpe, with their second son, Robert William (born 1890), a general labourer, and daughters May and Lizzie. Edward had married Elizabeth Johnson in 1907, and by 1911 was a 26 year old coal miner, living at 14 Queens Square, Old Basford, Nottingham, with his wife Elizabeth and their two year old daughter, May Elizabeth, who went on to marry Joseph Waplington (1908-1974) and died in 1999. Edward Cragg’s survival and return from the war are confirmed by his record in the 1939 Register. Here, Edward Cragg (born 28th June 1884, a colliery surface worker) and Eliza Cragg (born 18th January 1889) lived at 47a Palm Street, Nottingham, with their sons Ronald (born 22nd April, 1925, also a colliery surface worker) and James (born 6th May, 1933). Edward Cragg died in Nottingham in 1944, aged 60. James Frederick Coy, born 1889, was a son of George Coy, born in 1856 at Knipton, Leicestershire, and Betsy Coy, born 1855 at Sudbrooke, Lincolnshire. In the 1891 census, George Coy was a maltster’s labourer, and the family lived at Ermine Street, Ancaster, where their children were Barbara Alice (1880 West Willoughby), Lizzie (1882 West Willoughby), Ada (1883 West Willoughby) and Frederick (1890 Ancaster). They had had an earlier son, George, born in 1878, but he probably had died by 1891. In the 1901 census, they lived at 6 High Street, Bottesford, where there were George, a maltster, Betsy, Ada (18), James F. (11) and Edith E. (born 1888 at Willoughby). In 1911, George, now a domestic gardener, and Betsy lived at 3 Barkestone Lane, Bottesford, with daughter Mary Lizzie, a domestic cook, and grandchildren Edith and Charles. However, James Frederick had moved to Quarndon, Derby, where he, aged 21, was a bricklayer’s labourer, boarding at the home of Esther Pearce, a 40 year old widow supporting her six children. Only one of the children, Frederick William (17), was at work (as a ‘steam boy’), but she gained additional income by taking in two boarders, James Coy and William Lloyd, a gardener. In 1915, he married Esther Elizabeth Pearce, his former landlady, at Amber Valley (Ripley), Derbyshire. His military service record has not been identified with certainty, but two possibilities can be mentioned. Searches are bedevilled by the fact that ‘Coy’ was the usual abbreviation used for ‘Company’ and therefore appears in many records bearing no relation to men named Coy. Gazette 2nd August, 1916: Cadet Frederick Coy to be promoted to 2nd Lt (probation) on the 7th July, 1916, Lincolnshire Regiment. Medal Index Card: Frederick Coy, PS/1237, Lance Corporal, Middlesex Regiment then Leicestershire Regiment, Captain and Adjutant, Labour Corps. Medal Index Card: Private James Coy, 36296, Royal Lancaster Regiment. Gazette 1919: Frederick Coy, Army Labour Corps, France and Flanders, promoted Temporary Major and awarded the OBE. Which, if any, of these records applies to the man from Bottesford cannot be determined at present. Given his family’s close association with Lincolnshire, the first of the above is perhaps the most likely, but this is not confirmed. In 1929, the register of electors includes James Frederick Goy (a possible mis-spelling), Elizabeth Leake Goy and James Frederick Goy junior at 3 All Hallows Street, East Retford – could this be James Frederick Coy, now a widower with his two children? Fred Coy’s second wife was Ada Towndrow, who he married in 1937, in the Belper area, Derbyshire. The 1939 Register records them at 14, North End, Ripley, when he was an engine driver (‘railway shunter’). James Frederick Coy died at Belper in 1956, aged 67. Ada died at Belper in 1987, aged 83. No results returned for initial census searches of men called Frederick Dane born in the East Midlands counties of Lincolnshire, Leicestershire and Nottinghamshire. When ‘no county’ was specified there were only 6 results, none of them relating to the Bottesford area. The ‘closest’ which eventually emerged may be a Frederick Dane, born 1889 at Wisbech, Cambridgeshire, who was living in Grantham in 1911 (the name of the street in Grantham is illegible on the census form). Parents Robert Dane, a labourer in an iron foundry, born 1855 at Shordelham, Norfolk, and his wife Emily, born in 1864 at ‘Nordelph’, Norfolk. They had two sons: Robert, a foundry worker born 1888 at Lynn, Norfolk, and Frederick, born 1889 at Wisbech, also a foundry worker. Also in the household was grandson Leonard Dane Tuck, born 1905 at Marton, Lincolnshire. There was a Frederick Dane who died in 1978 at Hendon, Middlesex, though it is not at all certain that this was the man born at Wisbech. Parish registers for Bottesford, Muston, Redmile, Barkestone, Harby and Stathern were searched but they have no records for anyone called Dane. Some 14 War Service Records were found for ‘Frederick Dane’, results but none of these are linked to the Bottesford area. One of these was Private Frederick Dane, who was successively 23750 Leicestershire Regiment, 476208 Labour Corps, 615424 Royal Engineers – this could be our man in that he started his service in the Leicestershires, but the link needs to be confirmed. There was Frederick William Dane, Private 164523, Machine Gun Corps, but there is nothing to him to the Bottesford area other than a tenuous connection in that the MGC had its training camp at Belton House, not far from Bottesford. There was another Frederick Dane, 3787, Nottingham Yeomanry (South Nottinghamshire Hussars), who aged 28 was admitted to hospital on 7th June 1916 with a contused right thigh, after one year’s service. There must remain some doubt as to whether this is ‘our’ Frederick Dane, but it is better than anything else that has come to light so far. Frustratingly, Find my Past has a database of more than 700 service records for the South Notts Hussars, but none of these is for Frederick Dane. No satisfactory results have been found for the man named Frederick Dane who is named on the Bottesford ‘church organ’ list of servicemen. The initial search of census records for men called Harry Harris born between 1880 and 1900 identified several in Lincolnshire, Leicestershire and Nottinghamshire, but none that could be tied into the Bottesford-Muston area. Similarly, a search of WW1 military service records yielded over 100 results but none that could be connected with this area. A repeat of the census search then located one very tentative possibility from the 1901 census, this being a Henry Harris who lived at 44, Wharf Road, Grantham, and enlisted into the Lincolnshire Regiment in 1903. His father was William Harris, a carter born about 1853 at Castle Donington, and his mother was Eliza Harris, born about 1858 at Hanley, Staffordshire. There were five children: William junior, a miller’s carter born about 1881 at Shardlow, Derbyshire; John, a malster’s labourer born about 1884 also at Shardlow; Henry (Harry), a baker’s apprentice born about 1887 at Shardlow; Naomi, born 1984 at Grantham; and Ruth, born in 1897 at Grantham. A search of military records located Henry Harris, a baker, lived in Grantham, who was 17 years 5 months old when he enlisted in 1903 (28/4/1903) as Private 4029, 4th Battalion, Lincolnshire Regiment; he gave his next of kin as his father at 44, Wharf Road. This is the best candidate we have for the Harry Harris on the church list, although it is not possible to be certain. He would have been sixteen when he enlisted in 1903, and we can speculate that he may have left the army and returned home in the intervening years before WW1 started. Baking was a skilled trade, and a young man that had completed his apprenticeship and found work in Bottesford before WW1 started, might have come to be regarded as a Bottesford man when he re-enlisted. Unfortunately, this is mere conjecture and we at present have no information to substantiate this interpretation. A search of WW1 Service Records yielded over 100 results, of which none displayed an apparent connection with Bottesford. It is concluded that Harry (or Henry) Harris is a widespread name and that no one of this name has as yet been associated with Bottesford or its surrounding area during WW1, even though the name appears on the list of Bottesford service men. A search of the censuses for a ‘James Healey’ born in Lincolnshire gave 8 results, including a James Healey born in 1900 at Great Gonerby, near Grantham. A search of the BMD confirmed that a James Healey was born in 1900 and died in 1993 in Grantham. The census search also gave 5 results for Leicestershire, but none relating to Bottesford or places close to Bottesford, while that for Nottinghamshire gave no results. In 1901, one year old James William Healey and his step-brother Harvey Foster, 12, lived with James’ parents William and Mary Healey at 42 Hill Foot, Great Gonerby. William, 29, was a malster born at Great Gonerby; Mary, 28, came from the village of Ewerby. By 1911 the family had moved to 64 Wharf Road, Grantham. William had become a licenced victualler, and James had a younger sister Doris Lillian Healey. BMD search confirmed that James William Healey, b.1900 at Grantham, married 1923 Grantham to Florence Twycross at Grantham in 1923, and died at Grantham in 1993, aged 93. Florence Healey was born in 1902 at Grantham; her death was in 1981 or 1983 at Grantham. However, it must be emphasised there is no particular reason to conclude that the James Healey from Great Gonerby is the one on the ‘church organ’ list, except that he is the nearest, geographically speaking, that has been found. He was born and lived at Great Gonerby, about 7 miles from Bottesford. His father was the son of Thomas Healey, b.1853 at Grantham. There is no indication that he had a link to Bottesford. There are no Healeys in the Bottesford Parish Register. The only plausible possibility if the James William Healey left Grantham after the 1911 census to find work at Bottesford, perhaps as a farm worker. J.W. Healey, 9404 Private, Manchester Regiment City Battalions: it is known that the Manchesters were based at Belton Camp, near Grantham, before embarking to France, and that they mixed socially with Bottesford people. J.W. Healey, S/232873 Corporal, Royal Army Service Corps, then Lieutenant, Royal Army Service Corps (probably same man, following promotion). It is clear that these results can be said to identify the James Healey of the Bottesford ‘church organ’ list either in terms of his family background or his service record. He remains something of a mystery. A search of the censuses for G. Johnson yielded 17 results for men born in Lincolnshire, 9 for Leicestershire, and 15 for Nottinghamshire, but none of these could be tied specifically to the Bottesford area. One possible candidate from the 1911 census is an apprentice boot maker who was boarding with his employer in Grantham. This was at 154 Alexander Road, Grantham, where G Johnson, born about 1894 at Grantham, was boarding with Mr A.H.Robinson, 28, a boot repairer and maker born at Spittlegate, and his wife M.E.Robinson. However, there is no indication that this is Gordon Johnson, rather than George, Graham or some other name beginning with ‘G’. There were many Johnsons in Bottesford and Muston (including Isaac Johnson, one of the casualties commemorated by the Muston War Memorial). Gordon may have been a member of one of these families, who perhaps happened to be boarding with his employer in Grantham in 1911. However, this is no more than speculation. Another weak possibility from the census for 1911 might be that the person we are looking for was eleven year old Frederick W.G. Johnson, who lived at 4 South Station Cottages, Bottesford. His parents were William Johnson, 33, a signalman born in Bottesford, and his wife Elizabeth, 37, from Hull, Yorkshire. Frederick W G was born in 1900 at Doncaster, and his sister Daisy was born in 1908 at Bottesford. It is possible that the ‘G’ stands for Gordon and that this was the name that he chose to use, but this is no more than speculation. The Parish Register for Bottesford records no Gordon Johnson (or Johnston), though there was a George Johnson who was christened on 3rd January, 1880, son of Frederick and Maria. A search of WW1 Records for ‘G Johnson’ born in 1894 yielded 35 hits. One faint possibility among these is Gordon Handley Johnson of Retford, 2794 Private Household Cavalry, Notts Yeomanry (Sherwood Rangers), KIA Egypt 7/10/1916, but there isn’t anything here to connect him to the Bottesford area, nor is he entered on the Bottesford war memorial. The search for Gordon Johnson has been inconclusive. At this stage, it has not been possible to identify this man from the census or parish records, nor have any service records been located that might be relevant. Could it be that the name we have is incorrect, and it should be George Johnson? James Pratt and his wife Elise lived at 39 High St, Bottesford, at the time of the 1911 census. His father was John Pratt, b.1844 in Norfolk; his mother Elizabeth, also b.1844, came from Holme, Norfolk. He had two sisters, Jane and Alice. BMD records show that he was born in 1873 at Chesterton, Cambridgeshire. Elise (nee Baumann), born about 1872, was Swiss. The couple married at Grantchester in 1895. He died in 1957 at Cambridge, aged 84. In Bottesford graveyard, SE of the church, there is a headstone to Elise wife of James Pratt, died 9th May 1953 aged 81. In the 1901 census, James and Elise live at 6 Orchard Terrace, St Ives, Huntingdonshire, and then had moved to Bottesford by 1911. He described himself as a “groom and gardener”. Frustratingly, we have not found any information that can be shown to indicate specifically his military service, other than the fact that his inclusion in the ‘church organ’ list implies that he did spend some time in the forces during WW1. When the war started, in 1914, he was 40 years old, and perhaps unlikely to have enlisted voluntarily at this time. When conscription started, in 1916, he was 42, right at the upper age limit. Online searches using Find my Past and Ancestry recovered many service records for men named James Pratt, but none were shown to relate to a man from Cambridgeshire or who lived at Bottesford. For instance, a FMP search of WW1 Service Records based on James Pratt, born 1874±1, gave 27 hits but none for a man from Bottesford or born in Cambridgeshire. A search of Ancestry records was likewise inconclusive. Therefore, at present we are unable to say what his service record was, or indeed to confirm beyond doubt that he did serve with the armed forces at all. After the end of WW1, the Electoral Roll of Autumn, 1921, records that James and Elise Pratt lived at Market St, Bottesford, and those for Autumn, 1923, and Autumn, 1925, record the couple at Bottesford West End. James Frederick Goy was my grandfather. He was married to Elizabeth Leake Middleton, and their address was 3 All Hallows Street, Ordsall, Retford, Nottinghamshire. He survived WW1 and passed away in 1957. His wife passed away a few years before him. Hi Nina, Elizabeth Leake Middleton was sister to my great grandmother Beatrice Middleton. I would love to hear from you.